Mary Lou Williams' exclamation "You can sing!" still echoes in Susan's ear after their first musical encounter. 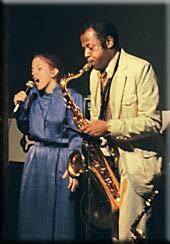 That was the start of her transition from classical music to jazz, a career that now spans decades. Her memorable work with the Paul Jeffrey Quintet grounded her in Charlie Parker and Thelonious Monk tunes, scatting in unison or harmony to Jeffrey's sax. That era also brought opportunities to sing with jazz greats Lionel Hampton and Les Brown, and for numerous festivals and concerts, including opening for Wayne Shorter. Currently Susan is creating her own BlueJazz sound: soulful, blues-infused renditions of standards and lesser-known gems. Her love of clever lyrics and inviting melody combined with her lush phrasing and rich extended range create a compelling listening experience, described by one listener as an "intelligent and passionate reading of the song." Susan's single "Madame Heartache" is receiving radio airplay including the internet station "radioioJAZZ.com", where it was a "Hot Pick" and "Fave" in the month of July 2006. She is a featured performer in festivals, concert series, and private events in the mid-Atlantic region, and has performed at the Montreux Jazz Festival in Switzerland. 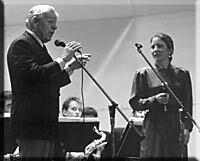 Also in demand as a big band vocalist, Susan was featured in the Ellington Tribute Concert with the Cape Fear Jazz Orchestra in Wilmington NC. Susan continues to expand her musical directions to include songwriting and arranging, and has been exploring various learning experiences. The Aebersold Jazz Camp introduced her to mentor Don Braden and included classes with David Baker, Chris Fitzgerald, and others, and trips to New York have brought opportunities to study with Jay Clayton, Judy Niemack, Giacomo Gates, Roseanna Vitro, and Sheila Jordan. Susan is the vocalist with the Raleigh Jazz Orchestra, and a Durham Arts Council "Emerging Artist". Her previous cd "aLive!" is available on her website, www.susanreeves.net. Susan's show on WSHA was heard every Monday night for 2.5 years, adding Radio Host to her skills.